In making the argument for the remedy of inequality, contemporary political philosophers often emphasize the arbitrariness of disadvantage, stressing how one’s lot in life is to a significant extent determined by the circumstances of one’s birth, that is, in which family, and in what part of the world. In the latter instance, people differ in how well they live in a large part because of their context in the global order. But equally important for a person’s chances in life is the family that raises her (if the person is lucky enough to have a family in the first place). In Family Values: the Ethics of Parent-Child Relationships, Harry Brighouse and Adam Swift provide a systematic analysis of the morality and politics of the family, exploring why families are valuable, whether people have a right to parent, what rights and duties parents have, and, in particular, what rights children have that may constrain the rights of their parents. The essays in this volume assess Brighouse and Swift’s contribution, taking up a number of controversial issues about autonomy, human flourishing, parental rights, and indeed the nature of childhood itself. 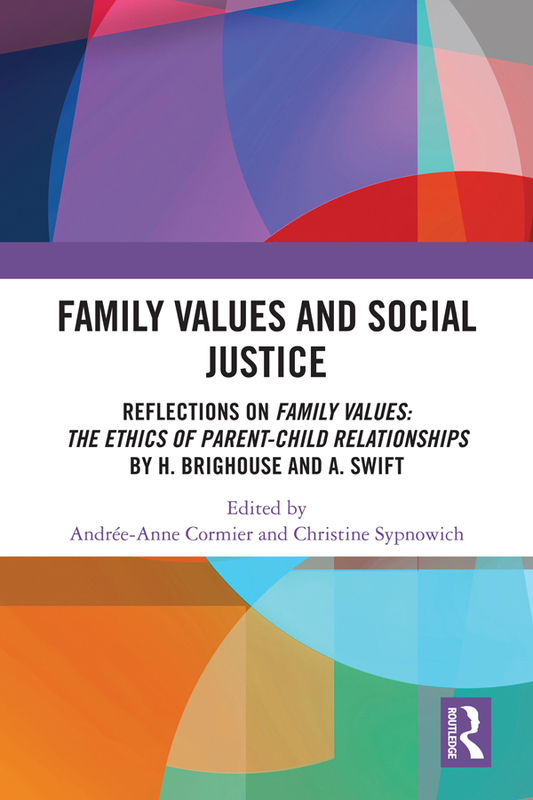 Contributors offer a range of arguments, some challenging, others complementing, of Brighouse and Swift’s account of the ethics of parent-child relationships. The chapters in this book were originally published in a special issue in the Critical Review of International Social and Political Philosophy. 2. Equality and family values: conflict or harmony? Andrée-Anne Cormier is an Assistant Professor of Philosophy at York University, Glendon College, Toronto, Canada. She was previously a postdoctoral fellow in the Law Department at the Universitat Pompeu Fabra, Barcelona, Spain, where she worked as a member of the Family Justice research project, funded by the European Research Council. Her current research focuses primarily on issues of legitimacy in upbringing, childhood, and gender justice. She also has published articles in philosophy of education and animal ethics. Christine Sypnowich is a Professor, a Queen’s National Scholar, and the Head of Philosophy at Queen’s University, Kingston, Canada. She is the author of Equality Renewed: Justice, Flourishing and the Egalitarian Ideal (Routledge, 2016) and The Concept of Socialist Law (1990), editor of The Egalitarian Conscience: Essays in Honour of G.A. Cohen (2006), and co-editor (with David Bakhurst) of The Social Self (1995). She is currently working on a book on G.A. Cohen, as well as starting a new project on heritage and political philosophy. Her work has appeared in such journals as Political Theory, Oxford Journal of Legal Studies, New Left Review and Politics and Society.